For the past several years Google AdWords has been releasing new ad extensions that were meant to expand the details that advertisers can “Add-On” to their various ads. Ad Extensions including Sitelinks, Callouts and Review Extensions, while limited in their own right, each provide more ad copy for ads that have an ad rank high enough to be listed in the top 3 spots of search results. While these have been great for PPC advertisers looking to differentiate their ads from their competitors, they have probably been a little confusing to searchers. This is due to their lack of consistency across ads and search results including the various other ad extensions that are in use like Location extensions, Call extensions, App Extensions, and Automated extensions like Seller Ratings, Consumer Ratings, Previous Visits and Social extensions. Phew! That’s a ton of Extensions to to keep track of for advertisers, let alone for users who are trying to make quick decisions on which listing to click on. 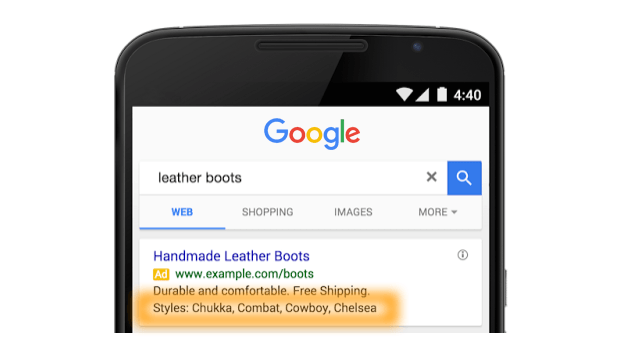 Google recently announced the launch of the new Structured Snippet Ad Extension. Structured Snippets is a version of the Dynamic Structured Snippets that has been an Automated Ad Extension for some time, only now you have the ability to customize and control the text copy by choosing one of 12 “Header” options. 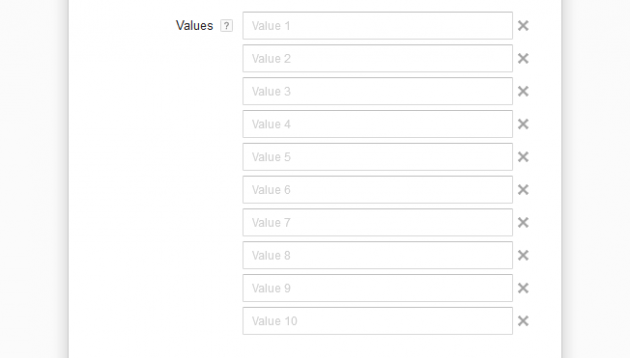 Each with up to 10 custom Values that can be added. I believe that this “Structured” approach to Ad Extensions will eventually lead to the 12 Header options being the de facto version for specific queries and verticals. Since Google’s announcement stated they’ve “starting to roll out structured snippet extensions: advertiser-provided structured information that show with your text ads.”, you may not yet have them showing up in your accounts. 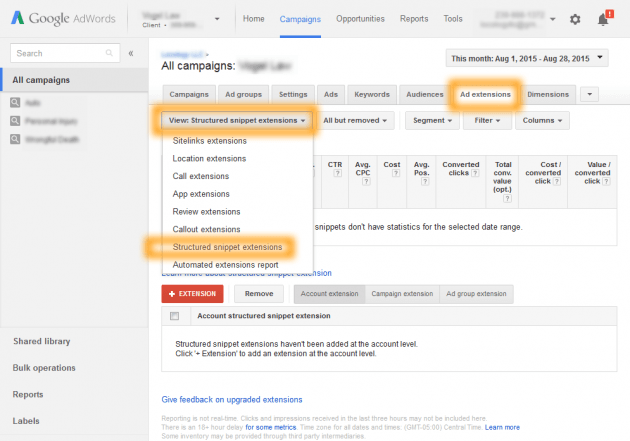 To check if you do, you’ll need to go into your AdWords account and visit the “Ad Extensions” tab. There you will find the dropdown menu for the various Extensions. Listed in that menu, and toward the bottom of the list, should/might be, the option for the “Structured Snippet Extensions”. That’s the one you want. 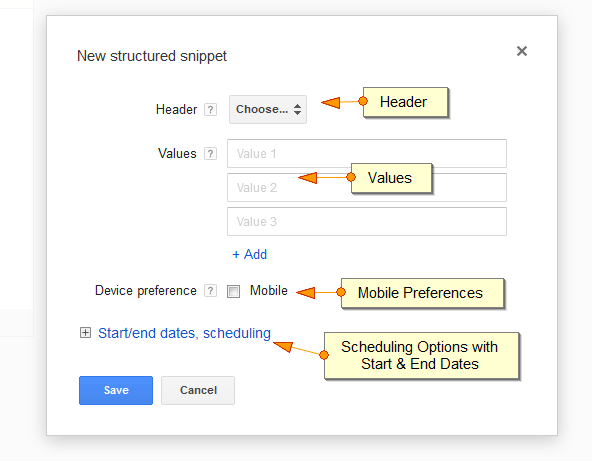 There are 4 main parts of a Structured Snippet, including the Header (category or snippet type), Values (your custom copy), Device Preference (if your snippet has mobile implications), and Scheduling options (start & end dates, days of the week, and times of the day). There are currently 12 Header options to choose from, although I’ve got a feeling that these will expand over time. Available options include Amenities, Brands, Courses, Degree Programs, Destinations, Featured Hotels, Insurance Coverage, Neighborhoods, Service Catalog, Shows, Styles and Types. Some of these, like Degree Programs and Featured Hotels, tend to be fairly specific, while the majority are broad enough to have useful applications across may different vertices and subject fields. As stated in the Header Support Text found in the [?] box, these should reflect what your business has to offer. Select a header that best reflects a category, feature, service, or product that your business offers. You can only choose one Header per Snippet. So if you have several different Header types that can apply to your campaigns, you can just create unique Snippets for each Header you wish to take advantage of. The Amenities option offers examples for WiFi, Pool, Fitness Center and Kitchenette. This Header could be used for businesses related to real estate, hotel and lodging, and hospitality industries. The Brands option offers examples for Nest, Nexus and Chromebook. This Header could be used for product based businesses like ecommerce merchants, shopping catalogs and retail stores. The Courses option offers examples for Creative Writing, Data structures and Linear Algebra. This Header could be used for businesses related to schools, online training and continuing education. The Degree Programs option offers examples for Business Administration, Accounting and HR Management. This Header could be used for businesses related to schools, colleges and higher-ed institutions providing accredited programs. The Destinations option offers examples for Paris, Berlin and London. This Header could be used for businesses related to travel agencies, hotel reservation sites, airlines and tour companies. The Featured Hotels option offers examples for Luxury Inn, Alpine Lodge and Lakeside Hotel. Similarly to the Destinations Header, this one could be used for businesses related to travel agencies and booking sites. 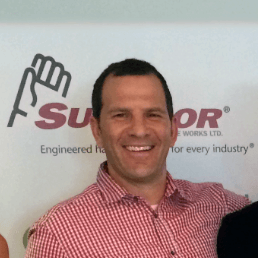 The Insurance Coverage option offers examples for Third-Party Liability, Collision, Umbrella and Car Rentals. This Header could be used for businesses related to personal and commercial insurance agents/agencies/rate comparison sites, as well as rental car companies. The Neighborhoods option offers examples for Financial District, SOMA and North Beach. This Header could be used for single and multi-location based companies and service area businesses who operate in specific towns/cities/neighborhoods of interest including delivery companies, real estate agents and property listings services, etc.. The Service Catalog option offers examples for Oil Change, Smog Check and Tire Alignment. This Header could be used for service related businesses like marketing agencies, auto repair/maintenance, dentists and medical professionals, lawyers, real estate services, etc.. The Shows option offers examples for The Voyage, Knights and American Dancer. This Header could be used for businesses related to Broadway Theaters, IMAX, Movie Cinemas, or even online entertainment sites like Netflix or streaming services. The Styles option offers examples for Chukka, Cowboy, Combat and Chelsea. This Header could be used for retail and product based businesses or fashion industry and beauty companies like hair salons. The Types option offers examples for T-Shirts, Mugs, Bags and Pens. While the examples suggest retail and product based usage, this Header could easily be considered a catch-all for businesses that offer different types of products and services, but do not immediately fit into one of the headers above. 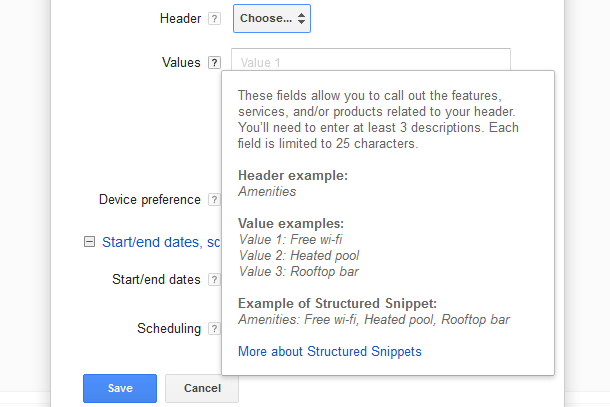 The Structured Snippets Values is where you place your custom copy related to each header. This is the text that searchers will see as part of your PPC ad. As stated in the Values Support Text found in the [?] box, these should be related to your header, no longer than 25 characters each, and you need a minimum of 3. These fields allow you to call out the features, services, and/or products related to your header. You’ll need to enter at least 3 descriptions. Each field is limited to 25 characters. Here is the full [?] support box. Since Mobile searches are now over 50% of all searches done on Google, it only makes sense that AdWords considers mobile’s impact on all new ads and ad extensions. 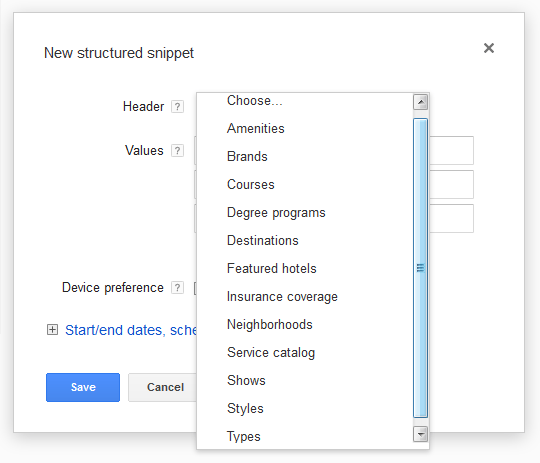 Structured Snippets provides the option for you to designate each snippet for mobile preferred in the same way as you can for Text Ads and other ad extensions like Sitelinks, Call and Callouts. As stated in the Device Preference Support Text found in the [?] box, this option should be used for campaigns and ad groups specifically targeting mobile devices. 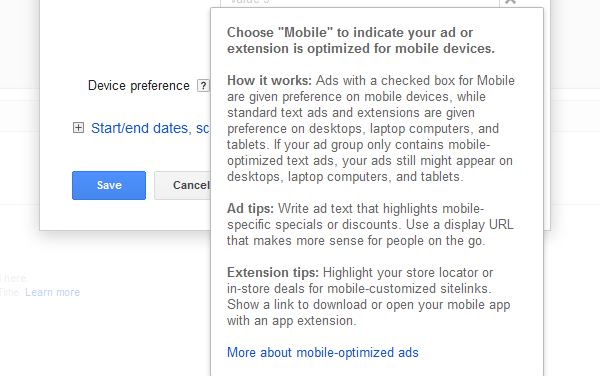 Choose “Mobile” to indicate your ad or extension is optimized for mobile devices. How it works: Ads with a checked box for Mobile are given preference on mobile devices, while standard text ads and extensions are given preference on desktops, laptop computers, and tablets. If your ad group only contains mobile-optimized text ads, your ads still might appear on desktops, laptop computers, and tablets. Scheduling Structured Snippets with Start & End Dates, by Time of Day, and Day of Week is a common application for Ad Extensions. This provides flexibility for businesses that operate differently at different times and allow you to change up your Snippets as best suits your business needs. An example of this might be a restaurant who has special offers such as a weekday-only happy hour, weekend bunch, breakfast vs. dinner menu options, have an outdoor patio in summer, etc. You can choose a start date and an end date for each of your structured snippets. This will allow you to set-up snippets for future use by setting a start day, and enable them to end on time for then they will no longer be viable. A common use for this would be seasonal or sales/promotions that are date specific. The calendar date selector is handy and mimics the date range menu used elsewhere in AdWords. As stated in the Start & End Dates Support Text found in the [?] box, this option should be used to control when you want your extension to run. Start and end dates control when your extension can run alongside your ad. What it does: By default, your extension will be eligible to run after it’s been approved. However, this field allows you to choose specific dates for the extension to run. Scheduling your snippets to run at certain times or days of the week is a great option for advertisers to have key promotions such as weekday/weekend offers, special show times, Happy Hour(s), or who cater to breakfast/lunch/dinner crowds, etc. As stated in the Scheduling Support Text found in the [?] box, this option should be used to control the times of day and days of week that you want it to run. Scheduling controls the days of week and times of day that your extension can run alongside your ad. What it does: By default, your extension will be eligible to run after it’s been approved. However, this field allows you to choose specific days of the week or times of day for it to run. 100+ Scheduling Options: During testing of Scheduling options, I was able to add over 100 scheduling times through the “+ Add” link below the date/time rows. That creates a considerable number of options for different offers and special messages to reach your audience at the specific moments that matter the most. Display Clock: The display clock option to switch between a 12 hour and a 24 hour clock is a nice feature as people in different parts of the world are more used to a 24 hours clock than us here in the US who commonly use a 12 hour clock with AM & PM designations. Time Zone: The time zone that will affect when your snippets will run is set in you AdWords admin section. This cannot be changed here so beware of this when you set up scheduling. As with most Ad Extensions these days, you can create Snippets at the account level to be shared among your different campaigns, or at the campaign level for campaign specific snippets, or unique Snippets that pertain to only very specific ad groups. Ad Group extensions take precedence over any Campaign level ones, and campaign level snippets show up for any ad groups that do not have their own designated structured snippets. 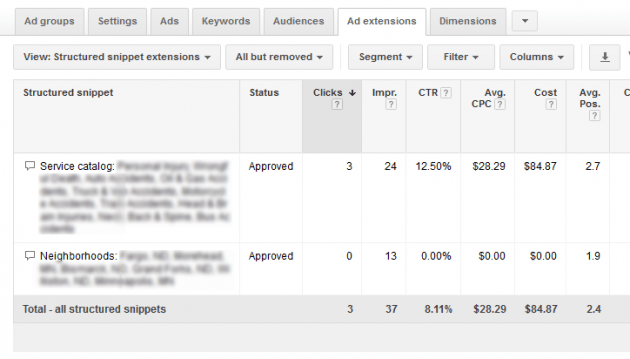 You are allowed to run more than one Structured Snippet in a Campaign or Ad Group. However the priority for which snippet gets served goes to the first snippet listed. This is similar to how priority for Sitelinks and Callouts is handled. As you can see from the following screenshot of a live account, the top listed “Service Catalog” extension has most of the impression and the “Neighborhoods” has fewer. When I originally set these up I had the Neighborhoods one listed first and it was receiving 100% of the impressions. Then, 2 days after they went live, I switched their order around and the Service Catalog has received all the impressions since. Here are the examples that I’ve found showing up live in search results so you can see how they are displaying and being used. There is a review/approval process that your Structured Snippets will have to go through. My 1st set took about a day to become approved and start generating impressions. As with all AdWords changes that need to go though review, the time it takes can largely depend on the quantity of reviews in the queue. However a 1 day turn-around time on these is quite encouraging. Structured Snippets have the ability to provide Google enough common aspects between different advertisers that they could eventually be the go-to ad extension for certain vertices and industries. And while they are relatively new, now would be the time to get started using them before many of your competitors do. If nothing else, by adopting them early you will generate more data in which to base smarter decisions on later. Great depth on the topic. You offered great ideas on how to use the various header types. I would like to learn how you are gathering and organizing data from your AdWords rich snippets extension to make clearer marketing decisions.